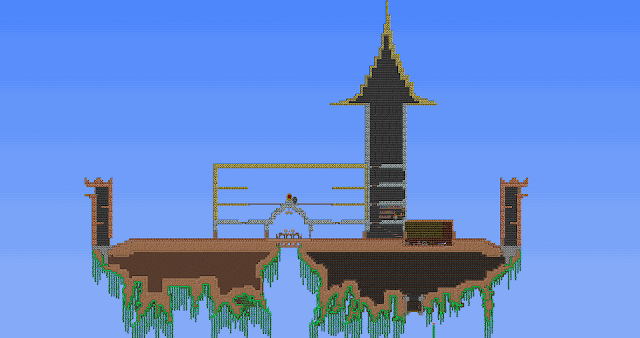 While the purpose of this sandbox was to keep in touch with TZ, Shura and Shini, Terraria had always been a treasure box of surprises for me. This randomly generated environments created explorer moments in the rather grey evenings between juggling job and applying work. I even got Lauren into it. Mind you this unlimited box of Lego as I may refer to it was more than easily adopted by both of us. I encountered a similar conundrum to what troubled me to the point of sawing Lego bricks as a child of 12; my resources were starting to feel...limited (sign of exasperation). 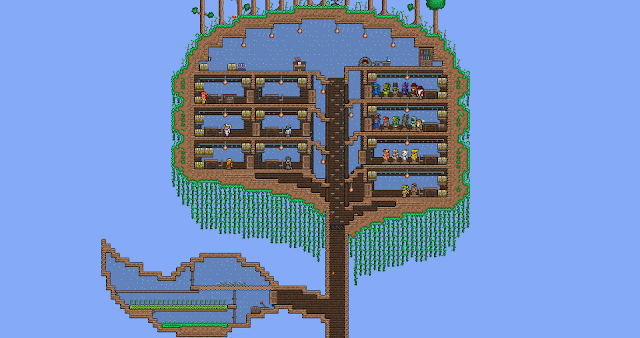 While the Tree House was a build that birthed naturally from the resources that were present. 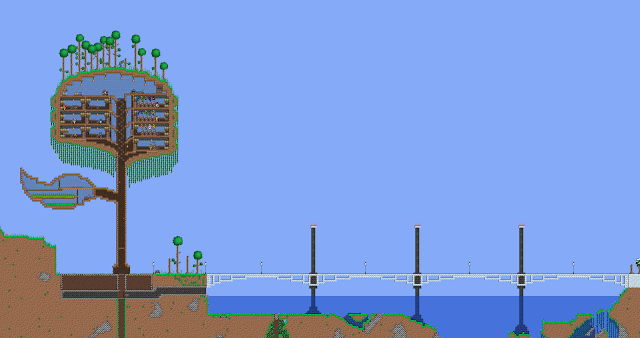 The snow bridge was meant to be a suspension bridge however, background cabling was not a feature Regedit thought of. Similarly the prehistoric pump system made filling up Lake Taho quite the task (yes that mass of water is all pumped from underground). Now I wish I recorded the initial view of that mass of land. Diversion. Point being that having no cabling did not bother me but the database of utilities at my disposal started to show their limitations. However, when it got to the Castle in the Sky, some critically required resources became apparent such as better theme decorations. and more importantly, a castle requires secret passage ways. The day when active blocks came to be I was over the moon full of anti-gravitation potion (**chuckles** while Lauren Facepalms. It's like scene in episode 3 of Daily lives of High School Boys when a girl passes by while they were re-enacting a scene from an J-RPG...ehem...diversion). 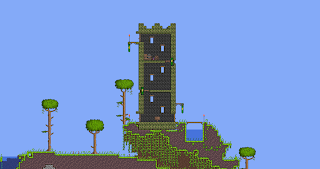 ONLY to find out that active blocks can only be active STONE blocks, here is one of those moments when you scroll through your menu and wiki and stare blankly into your imaginary conversation with Regedit: 'Really man would it have been that hard?'. It is not a very secret passage way if it is made of stone within gold bricks. Because MR Sir here decided a Castle in the Sky mash-up with the Mysterious Cities of Gold reference just HAD to be built with gold bricks. As an Elder Scrolls Series fan, I was more than familiar with video game mods--more so as a leecher than a seeder--for all the wrong AND right reasons. With a couple of Unity Projects on hiatus namely Basic FPS and top down fear shooter, my Java skills were rusty and C++...well C++ skills were non-existent, google being my saviour, the search Terraria Mods opened a whole new worlds within Terraria for me. 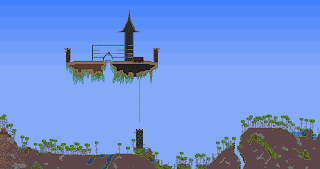 The sandbox within the sandbox and the possibility of being more than just another leecher after s u c h a l o n g t i m e. People out there had already started dissecting Terraria to the world of the divide by zero. In my favourite 2D environment attached to a 3D screen, therein lied the perfect knife to cut the Lego bricks in whatever form I wanted. All it would take was some C++ and some photoshop skill. The Cybergod bless tconfig and object oriented programming.